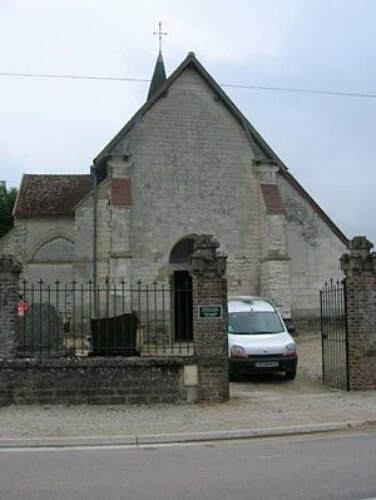 Trouan-le-Petit is is a village in the Department of the Aube, some 40 kilometres north of Troyes and 6 kilometres south-east of Mailly-le-Camp. 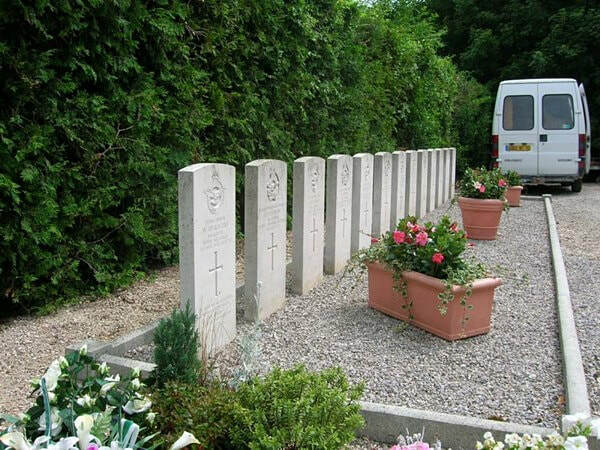 The crews of two Lancaster bombers are buried in Trouan Churchyard. They are on the left of the main entrance. The airmen died on the 4th May 1944. There are 13, 1939-45 war casualties commemorated in this site. Incident: both aircraft crashed at Trouan-le-Petit, Sgt. W. Richardson of LM437 survived the crash and avoided capture. Sgt. Richard Walter ANDREWS, R.A.F.V.R., 625 Sqdn. Pilot Officer Neil McCarthur McGAW, R.A.F. Flying Officer Daniel MORIARTY, R.C.A.F. Sgt. Robert Matthew DAND, R.A.F.V.R. Warrant Officer, Class II Gordon Herbert HOBSON, R.C.A.F. Sgt. Robert Alexander SNEDDON, R.A.F.V.R.